Okay, admit it. 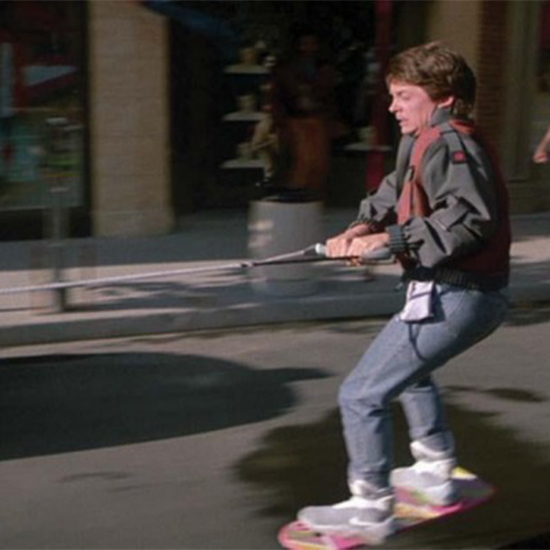 There was at least one night in your life where you got a little tipsy and started talking about how you could build a working hoverboard. Like, you’d just have to make sure the air jets pushing down would create the right amount of lift, or something. Or what if you made a hoverboard court out of magnets, and then made the hoverboard out of opposing magnets so they’d repel each other? It would totally work! Well, now you have the opportunity to back Hendo Hoverboards on Kickstarter, and, for $10,000, get a real hoverboard of your very own. While our hoverboard is primarily intended to be self-propelled, the actions which stabilize it can also be used to drive it forward by altering the projected force on the surface below. Currently, this surface needs to be a non-ferromagnetic conductor. Right now we use commonly available metals in a simple sheets, but we are working on new compounds and new configurations to maximize our technology and minimize costs. It was magnets this entire time! I was right, other people in the bar who were with me that night! We could totally build a working hoverboard out of magnets! I don’t have $10K to spend on a hoverboard, but I look forward to seeing the reviews from the people who do. Also, you’d better save a little extra cash for a trip to their hoverpark (location currently not designated), because your hoverboard will only hover on special surfaces. Anyway, hoverboards are real, they’ve arrived right on schedule, and they’re currently selling at the $10,000 price point.